Sorry for the dorky post title but I an in bit of a food coma. A food slash beer slash Cocoa Camino almond butter chocolate bar that I ill-advisedly bought when I popped into Herb and Spice afterwards for eye makeup remover coma. You see, I have just come from my office Christmas party. It was actually a bit of a nail-biter for me at first, since I suggested the restaurant. I picked the Imperial because I knew that, while it caters to a mostly omni crowd, it has at least one vegan entrée. I admit that I was mildly concerned that the food and/or service would stink and that the two dozen public servants with whom I work would react by blaming the vegan. My fears were assuaged pretty quickly, however, as polite and efficient servers fed us alcohol. Those fears evaporated completely when our food arrived. Neil and I had the Southwest Vegan Black Bean Burger. 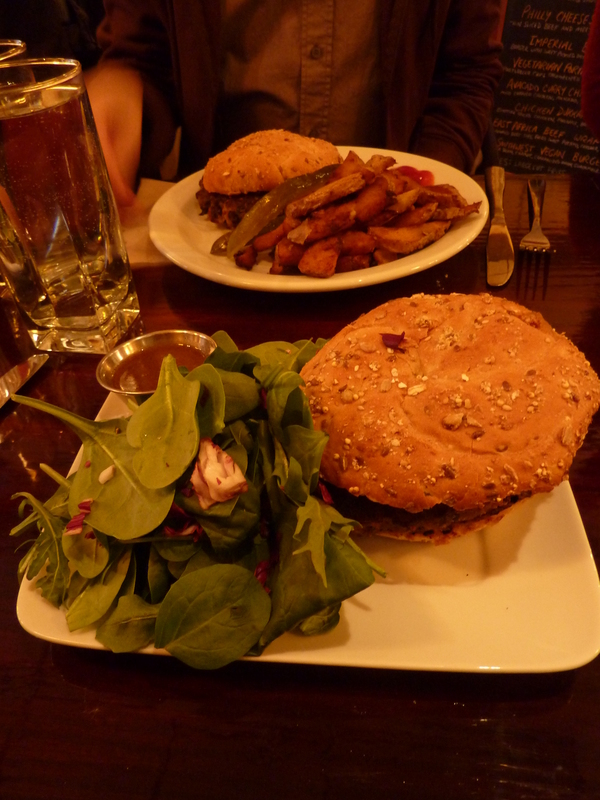 It was simply presented – Neil’s with fries and mine with salad. I know you’re already thinking that I probably ate his fries and yes I did and so what? I do apologise, however, for also sharing his fries with an adjacent female colleague who also ordered the salad in a moment of self-delusion. That was a bit much even for me. Now what…um, the salad dressing was really nice – some sort of Asian inspired concoction. Unfortunately, the salad itself was profoundly bitter – I only wound up eating a quarter of it. The burger itself was only pretty good. It was a little on the mushy side. The bun was a tad crunchy (over-toasted, I think, rather than stale). Still, good enough to attract me back for a second go. Especially given just how totally charming the Imperial is, with its vintage posters advertising ultraviolent 70’s B-movies and the weird Ms. Pac Man sign above the bar. Of course, I can’t speak to the omni options. I didn’t taste them and didn’t make inquiries of those who did – being somewhat disinclined to hear about how tender or nicely spiced the cows and pigs and fish were. Still, the general air of satisfaction that emanated from my colleagues suggests that The Imperial is a safe place to bring your omni pals. So thumbs up to the Imperial. I should also note that they have a 3-option Sunday brunch and that one of said options is vegan. I’ve had it several times now and, as clichéd as it sounds, each time was better than the last. 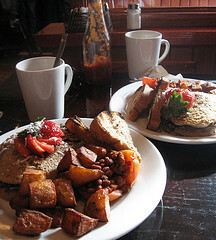 The vegan meal includes pancakes, beans baked in a tomato, toast and pan fried potatoes. Not cheap but, well, god hates a tightwad, doesn’t he?